Bondo has a special relationship with the XB-70 going back to 1966. On the morning of 8 June he and about ten other navigation school students were slogging their sweaty way in a T-29 from Mather AFB in Sacramento down through central California on the route fondly remembered by thousands of USAF navs as Overland South. Just north of LA we received a radio transmission on Guard from LA Center advising all aircraft to stay well clear of a radial and distance off the Peach Springs (AZ) VORTAC. When our aircraft commander queried LA Center, they refused to elaborate. Only when we landed back at Mather did we learn that the Number Two XB-70A had been lost north of Edwards in a midair collision with an F-104 flown by America's then premier test pilot, Joe Walker. The ill-planned PR photo event (featuring General Electric jet engines) not only resulted in a tragic loss of life for two of the three pilots involved, but represented the same monetary cost as if the carrier Enterprise had sunk. Although at the time the future of the XB-70 was somewhat in doubt due to rapid changes in Soviet strategy and aeronautical development, the crash was to be the beginning of the end for the program, and in 1969 the surviving Number One ship was flown to Wright-Patterson AFB for display in the USAF Museum. Bondo and other members of the C-133A crew that delivered the X-15A-2 to Dayton that same year were treated by the museum staff to a VIP behind-the-scenes tour up into the cockpit of the huge bomber. 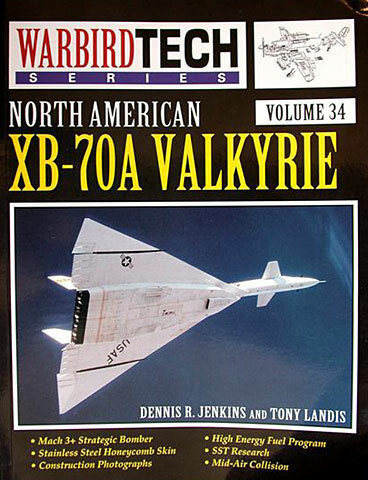 Although the Bondo Industries library was already populated with at least three B-70 books (both editions of Steve Pace's Aero Series 30 as well as an XB-70 Photo Chronicle by John Campbell and Garry Pape) this 104 page Warbird Publication brings welcome additional material, pix and improved production values such as glossy paper, better resolution and more color. Because we're talking about just two airframes, much of the book's content has already been covered in the above-mentioned publications, but this new entry may well be the best of the group. The historical lead-in to the subject is quite detailed and even includes background on three of Bondo's recent completed projects, the XF-103, F-108 Rapier and Sukhoi T-4. Being a fan of aircraft construction techniques, I especially appreciated added pix of the bird's fabrication, many of which processes were truly cutting edge. Ditto for powerplant details and special systems such as the Alert Pod and Offensive Subsystems. Appendices included near the book's end (and not as well detailed in the earlier pubs) are in-depth coverage of high energy alkyl borane fuel, a test pilot's perspective (flight test summary) and an XB-70-derived SST. Of the XB-70 books currently available, I'd say this would be the one to buy. The only "semi-miss" I could find was the lack of a large three-view foldout such as included in the first edition of the Steve Pace book.